The Census Bureau has released their alternative measure for poverty research and boy it's a doozie. The official 2010 poverty measure results in 46.2 people, or 15.1% living in poverty in the United States. The alternative measure gives 49.1 million or 16% of all people living in the United States are in poverty. The population in 2010 was 306.1 million. The actual gross income threshold levels are still low. 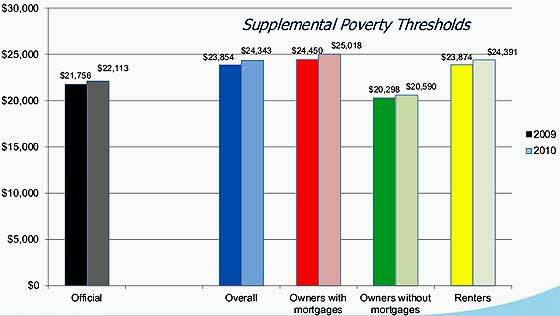 Below are the poverty income thresholds for a family of 4, two adults, two kids. While groups warn the GOP will seize on this alternative poverty measure to destroy more social safety nets and services, it's not clear how. Both measures show disaster for most of America and a huge underclass in the United States. The alternative poverty measure includes social safety net benefits and most importantly, this measure include medical expenses. Below is a summary of the differences between this Census alternative poverty measure and the official one. As we can see, the earned income tax credit is one of the most effective tools to keep people out of poverty and the #1 thing throwing people into poverty is medical expenses. Gets worse from there, medical expenses are seriously throwing ruining older people financially. Realize this is with Medicare. Below are the percentage differences by age. 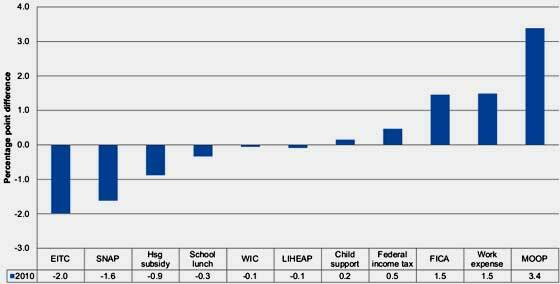 Look at those in poverty at age 65 or older. Medical costs are literally driving people into poverty further than they would be with proper health care. There is much more information, data, graphs and analysis on the Census website. The multimedia created by the Census report authors makes it clear, by any measure, America is turning into a 3rd world nation. 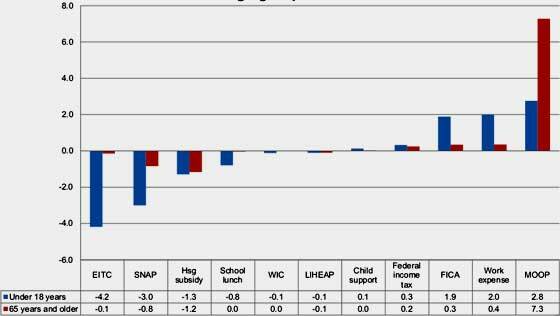 Here's what is alarming and has attracted considerable attention: we would have thought that the resources included in the new measure (counting SNAP, WIC, housing and heating subsidies, Earned Income Tax Credit) would have resulted in a lower overall poverty percentage. That the result of the new measure is an increased poverty rate is surprising and has attracted considerable commentary, mostly saying that the increased poverty result is primarily attributable to Out-of-Pocket Medical. I suspect that a lot of that increase is probably due to dental care expenses. Less attention is being paid to Child Care Expenses and Child Support Paid categories. These two categories are subject to controversy and interpretation, and overall averages or totals for these categories are problematic because of differences at the level of individual cases. Child Care Expenses are subject to off-the-books adjustments: should Grandma be paid for child care, etc.? How this kind of question is handled probably varies from state-to-state, creating problems for any survey. Similarly, Child Support Paid is subject to enormous variation from state-to-state and even from court-to-court (in some states). The presumption of the public that it's all a matter of dead-beat dads versus long-suffering abandoned moms is, at best, simplistic. There are plenty of examples of a household that is objectively poorer than another household having to pay to a household that is objectively above poverty level. The IRS rule is to consider child support paid (by the payor household) to be taxable as income of the payor, not infrequently working arbitrarily to shift income from children in the payor household to children in the payee household without equitable regard for apparent need. Scheming and scamming activity is a notorious problem in this regard. IMO, the IRS rule should be that Child Support Paid is taxable as income of the Payee (Plaintiff) household and not the Payor (Defendant) household (as of the actual transfer of moneys). The contrary way it now works goes back to the idea that all money judgments are to make whole an injured party, that is, to tort theory. There is an IRS form to correct all this to a small extent by allowing the payor to take the dependent child deduction/credit; however, this is anything but automatic. Dependent child deduction/credits are properly a matter for adjustment according to contributions and circumstances of the two (or more) households involved; however, these deductions/credits can also become issues of negotiation between two warring households and even (sometimes) between two warring states. Notwithstanding the Full Faith and Credit Clause, issues of law can become incredibly complex when two or more states are involved, with states applying different standards for such crucial procedural matters as service of process. Welfare fraud and even citizenship fraud have become involved, sometimes involving identity theft, very difficult to prove. Attempts to rationalize the system are generally defeated in many state legislatures, with some family-law attorneys weighing in on the side of keeping the whole thing as complicated and difficult as possible. All this said, it's better to subtract Child Support Paid (money leaving the payor household) from resources available to the payor household and to add that money to the payee household's resources, since that's generally the underlying reality. Best of all, of course, is to avoid divided families, unemployment and poverty.